Is Motorcycle Road Racing Dead in the U.S.? I’ve been a motorcycle road racing fan for slightly less time than I’ve been a Formula One and WRC fan. Considering that I made a point of attending the return race of Formula One in the U.S. at Indy in 2001, that’s still a pretty long time. I unfortunately missed out on the height of U.S. motorcycle road racing as it happened, but thanks to video, anyone can watch some of Kevin Schwantz or Wayne Rainey’s legendary rides any time they want. Thankfully, I was watching during part of the Hayden dynasty, and in the Spies era -- and those were exciting times to be a fan, too. For modern U.S. motorcycle road racing fans, both Nicky Hayden and Ben Spies represented something we see all too seldom -- a viable, talented rider who’s able to compete on the world stage. Ben Spies came up through the ranks in U.S. road racing, winning three straight AMA Superbike Championship titles from 2006-2008. Additionally, he won a single AMA Formula XTreme title in 2003, and an AMA Superstock title in 2007. He then successfully made the leap onto the world stage by competing in the World Superbike Championship, where he won the 2009 WSBK championship in his rookie year against none other than the likes of Noriyuki “Nitro Nori” Haga. But Spies wasn’t done yet. Rather than rest on his laurels, he promptly took his elbows and went to MotoGP. The proverbial big fish wasn’t content with what he saw as too small a pond. Sadly, Spies didn’t have nearly as easy a time. A MotoGP bike is a completely different animal from any other bike on the planet. Even talented riders in other series might not have the best time on one of those, and Spies found this out the hard way. 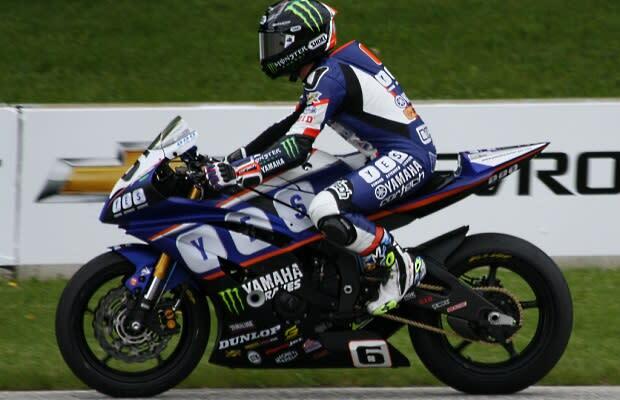 Even on a Yamaha factory machine, he was no match for teammate Jorge Lorenzo. After falling from factory grace and finding himself at privateer team Pramac Ducati, Spies proceeded to injure himself and sit out several races on a few separate occasions before finally being forced into retirement after sustaining career-ending permanent shoulder injuries in the 2013 MGP season. Nicky Hayden came from racing (and owning the world of) dirtbikes and rose all the way to MotoGP glory. In 2005, Hayden came 3rd in the World Championship standings, but he won his first (and so far only) MotoGP World Championship in 2006. Both riders are somewhat rare in the modern era, as most MotoGP and World Superbike champions tend to be from somewhere in Europe. Spanish riders, in particular, tend to own the world stage of motorcycle road racing. Why is this? There are many reasons, but the most basic one is that a supportive framework of motorcycle schools and racing opportunities exists in Spain. The U.S. use to have one too. It might not have been as extensive Spain&apos;s, but it nurtured young talent and brought those riders up the ranks so they could gain the skills necessary to hone that talent. A crucial component of that ladder to success has been the various AMA Pro road racing series. Fans will argue heatedly about the dire straits the AMA was in before the Daytona Motorsports Group (DMG) took the helm, but one thing is certain: the AMA Pro SuperBike and Daytona SportBike series used to have television contracts for the entire season. Television contracts are very important things to the valuable sponsors who fund these talented riders. When you screw up so badly that one of the races you aren’t televising is at Laguna Seca, your sponsors are going to notice. But that was 2013. What of 2014? 2014 is super simple: There are no television broadcasting deals whatsoever. There is live streaming of race weekends available at FansChoice.tv. But that’s it. Sure enough, title sponsor Geico Insurance and motorcycle factory efforts like Yamaha pulled out of supporting the AMA series entirely, and you can&apos;t blame them. Not that there would have been much of a series to air anyway -- only 5 (or possibly 6, depending) race weekends will happen in 2014. Fans of any other sport would go absolutely batshit insane if you cut the season down to only 5 or 6 events. Not to mention absolutely no races are taking place west of the Mississippi. If you’re the least bit interested in motorcycles, you’ll know that this makes no sense whatsoever. Granted, the man has connections, but the point is that he managed to organize all this in almost no time at all. Meanwhile, back in the AMA Pro series, another race weekend at Laguna Seca started this week (July 11, 2014). It’s running as support races to the World Superbike championship round at Laguna, which will be broadcast throughout this country on beINSPORTS. According to RoadRacingWorld, the magazine reached out to several key figures at AMA Pro Racing if the Laguna Seca AMA Pro events would even be shown on fanschoice.tv. RRW received no response, and got a big “I don’t know” when they asked in person at the AMA Pro round at Barber Motorsports Park in June. Apparently, part of the 2013 Laguna Seca debacle involved AMA Pro Racing not paying Dorna (the company that promotes both MotoGP and World Superbike around the world) money that it owed. Hence, no TV coverage. During the September 2013 WSBK round, Dorna was kind enough to broadcast the AMA Pro Racing series to the TVs within the facility, so fans and media who weren’t out along the racetrack could keep up. But it didn’t go out over the air, and was never broadcast to the country’s fans. Sponsors like the National Guard, who weren’t getting any promotion, pulled out. You can read a full chronology of the decline of the AMA Pro Racing series here at RoadRacingWorld. So what about this weekend’s AMA Pro Racing events? RRW thinks it’s unlikely that there will be ANY broadcasting whatsoever—not even at the track itself, let alone via the pitiful option of live online streaming that has been the only way to watch AMA Pro Racing this year (without actually being there). At this point, I don’t know if the AMA Pro Racing series can recover. Relationships with sponsors, manufacturers, teams, and fans have all been significantly soured. More importantly (and more sadly), I don’t know if those in charge of the series want it to recover. The 2014 Geico Superbike Shootout series proved that it’s possible for another series to come together, and to pull talented racers and teams together with both sponsors and a broadcast TV deal. Plans for the GSS to continue in 2015 have not been announced, but I know I’m not alone in hoping that it (or a similar series, perhaps with more racing events scheduled) happens. There are smaller racing series around the country that don’t have TV deals, and they do just fine supplying their regional areas with some live racing action that fosters young talent. But how are those talented young racers supposed to get from those series up into World Superbike or MotoGP? Without something at the level that the AMA Pro Racing series currently (barely) inhabit, that jump is just about impossible. It was the legendary Kenny Roberts who first made the world take an American road racer seriously. He came up through dirt track riding and the AMA and launched an unparalleled racing career. Without something to fill the massive gap that AMA Pro Racing is currently carving itself, any potentially talented racers we have will find making a leap to the international stage next to impossible.